Amazing Grant Stewart show today! 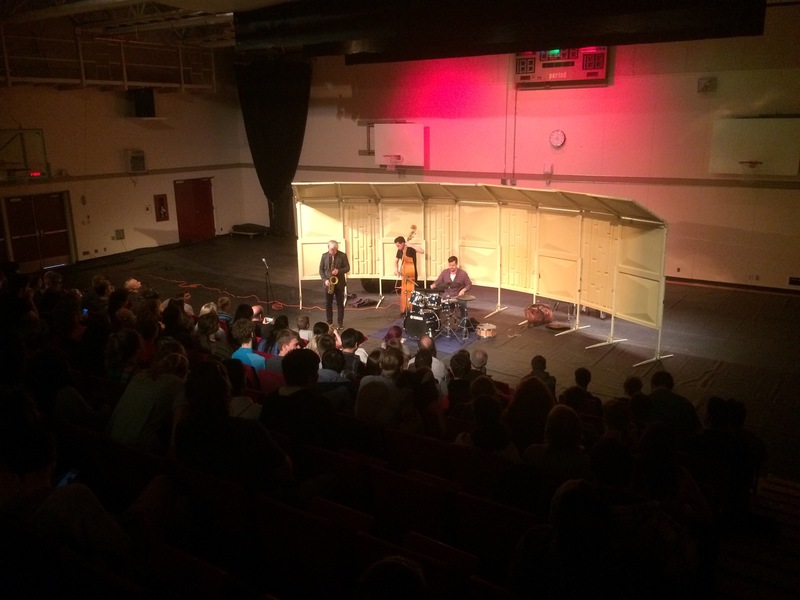 It was a pleasure to host the Grant Stewart Trio today at DW Poppy. We we joined by students from Mountain, Fine Arts, Fundamental and Garabaldi in Maple Ridge. 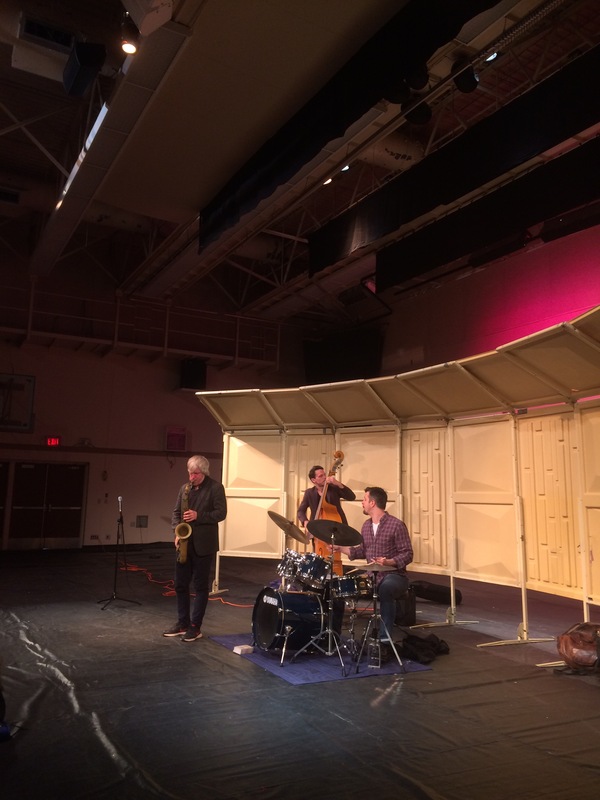 Grant (on Tenor Sax), Paul Sikivie on Bass and Philip Steward on Drums performed 8 tunes for the students. They were some more obscure standards from Bud Powell and other jazz legends. They also did a 30 minute question and answer session with the kids, a highlight being a demonstration of how to begin improvising by “decorating” the melody, using Body & Soul as an example. It was a great show and I have a few CD’s left. If you’d like one, bring in $10 cash. Ifs run out, I’ll order a few from Cory next week. Thanks for having the kids there after school and supporting their music education! We’ve now completed our first full week of music at DW Poppy. Musical theatre got rolling along with the choral and jazz programs and the Senior Wind Ensemble. Beginners have selected instruments and we hosted the elementary band rental night and first lesson on Thursday. We continue the tradition of bringing great artists into DW Poppy to work with our students this year. At the beginning workshop, out elementary students not only worked with Mr. Ablitt and Mr. Follett, but local profesional flautist Michelle Carlisle and clarinetist Colin Farquar, and thanks to Conn-Selmer, Vancouver saxophonist Brian Engstron and internationally renowned trumpet player Rich Wetzel. Our next guest will be New York Tenor Saxophonist Grant Stewart. In partnership with Cory Weeds and the Coastal Jazz and Blues Society, Grant’s trio will be putting on a show here at DW Poppy next Monday at 3:30. We expect all jazz students to attend, and encourage all our music students to join us, along with music students from RE Mountain, Langley Fine Arts, Langley Fundamental, and Garabaldi Secondary (Maple Ridge) for this phenomenal opportunity. In the meantime, please remember that Student Commitment Contracts and Practice Routines we due yesterday. We’ve received many of them, but there are still a few to come in. Also, Junior Uniform, Method Book and Band Folder Orders are due this coming Friday, September 23. We hope to see lots of new and familiar faces out at the first music teacher parent meeting on Tuesday, September 20 after the grade 8 parent night at 8:00pm. It will be an intro to the program for some families and an opportunity to connect with parents interested in supporting their kids’ musical endeavours which we’ll aim to keep it brief at that hour. Please remember to add your child’s concerts from the Music Handbook to your family calendar if you haven’t yet, and as usual, if you have any question, don’t hesitate to ask. Welcome to DW Poppy’s 2016/17 season! With off-timetable rehearsals starting this week, we have lots of great things happening. The website will continue to be updated with the new calendar and such over the coming week, but please be sure to complete the Student Commitment Contract and read the 2016/17 Handbook that is coming home right now. Parents, we look forward to seeing you at 8pm on Tuesday, September 20 for the first music parents meeting. We also look forward to seeing everyone at 3:30pm on September 26 for the Grant Stewart Trio live at DW Poppy. If you did not receive the email this weekend, please contact Mr. Follett with your current email address. We hope everyone had a great summer and welcome back!